As most Caledon residents have already discovered over the past year Highway 427 now ends slightly north at Zenway Boulevard which is just slightly above the old terminus of Highway 7. This tiny 800m expansion however is only an Interim Arterial Extension, a York Region Capital Construction Project and not the actual 427 extension which has been currently studied for the past few years. Originally the Highway 427 expansion was envisioned to go north to Highway 9 with talk of it going even further north toward Collingwood. Any thought of those plans are long dead, in today’s times with public and government more conscious about the environment it is unlikely that the 427 would ever be expanded beyond Bolton if it even gets that far. Currently the plan is to extend the 427 north to Major Mackenzie Drive as it will service the CP rail yard keeping more trucks off of Hwy 50 and 27 as well this terminus location is in line with other planned municipal road improvements and will have the least environmental impact. If all goes ahead with current preferred route the Highway 427 will be extended approximately 6.6km from Hwy 7 and will have 3 new interchanges at Langstaff Road, Rutherford Road and Major Mackenzie Drive. The expansion will consist of 6 lanes from Steeles Avenue to Rutherford Road and go down to 4 lanes from Rutherford to Major Mackenzie with possible HOV lanes in each direction. Also to be added would be a new carpool lot at the Rutherford Road interchange. Interestingly in the key features of the latest 427 Transportation Corridor Environmental Assessment Study report it still makes note that it “will not preclude future extension of Highway 427” still leaving the door open for the future to go beyond Bolton if needed however that may be exceedingly difficult with Green Belt and the Oak Ridges Moraine just above, local opposition to the 427 going north of Bolton would likely be much stronger. For more information about the 427 Extension you can visit the official study website. All the current public information from the last meeting can be found by clicking here. When will this start. I will be very happy because my home backs up on HWY 27. This would be great for all the home owners on the east side of hwy.27the traffic is getting very bad and the noise level is to high. Also why is the speed at 70km behine a resideula community. The expansion of hwy 427 to at least Major Mackenzie is much needed due to the increasing population of King Township with new subdivisions arising, specifically in Nobleton. Currently Hwy 27 is the only route that goes north to Nobleton from Hwy 7 and in most places it is only one lane. too bad if you dont like 27 clogged up…..you chose to live where you live. deal with the traffic or pack up and leave the area. you will not be missed. The 427 should go as far as Barrie. The 400 is way too congested and a death trap in the winter. With an extension that far north, all traffic going westbound from the north can use the 427 and all traffic eastbound from the north can use the 400. Makes things a lot less congested. Build the 427 to the 9th line just north of Hwy 88. Build a new”Hwy 488″ east/west from Hwy 404 passing north of Bradford to 427extension. Travel on the congested 400 can now have options. West GTA can travel can north/south on 427 to “488′ and continue on 400 to Barrie. East GTA travel can north/south on 404 to “488” on continue on 400 to Barrie. The present 400 can be used to carry Toronto core traffic. In other words, travel can have the option of a ‘pitch fork’ route to north of Bradford then continue on an widen 5 lane 400 to Barrie. Visa versa on a return. 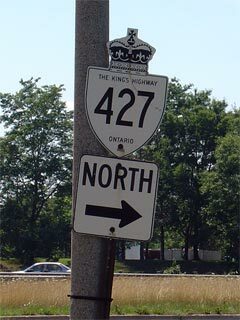 In my opinion, the 427 should be extended at a minimum to King Sideroad. Any disruption to traffic on 50 or 27 is a HUGE problem for anyone travelling into/out of the city from anywhere north of Nashville Road. It would be wise to extend it to Hwy 9 to help alleviate all traffic routes heading in/out from the north & north-west of the city and would provide an alternate route for travellers heading to cottage country. The 427 should at least be taken up to Hwy 9, this would alleviate traffic congestion through Bolton, Palgrave, Nobleton and Schonberg. As it stands now, these Villages, are congested with all traffic going through them on Hwy’s 50 and 27. This Provincial Government, has been very irresponsible, when it comes to roads and hwy infrastructure, it is very short sighted when it comes to planning for the future, this extension should have been done 10 or 20 years ago, when it would have cost 100’s of millions less to complete when you factor in today’s wages and land acquisition. When will governments wake up and start planning responsibly?